Take a Network Break! In our latest analysis of what’s happening in IT, Amazon rolled out a host of announcements at its Reinvent conference. Of particular interest is Outpost, which is Amazon-supported hardware to run on a customer’s premises. Outpost has two software options: native AWS, or VMware Cloud on AWS Outposts. Amazon also announced AWS Transit Gateway, a virtual router that lets you connect multiple VPCs as well as on-premises workloads; and App Mesh, which promises to monitor and control microservices you run in the AWS cloud. 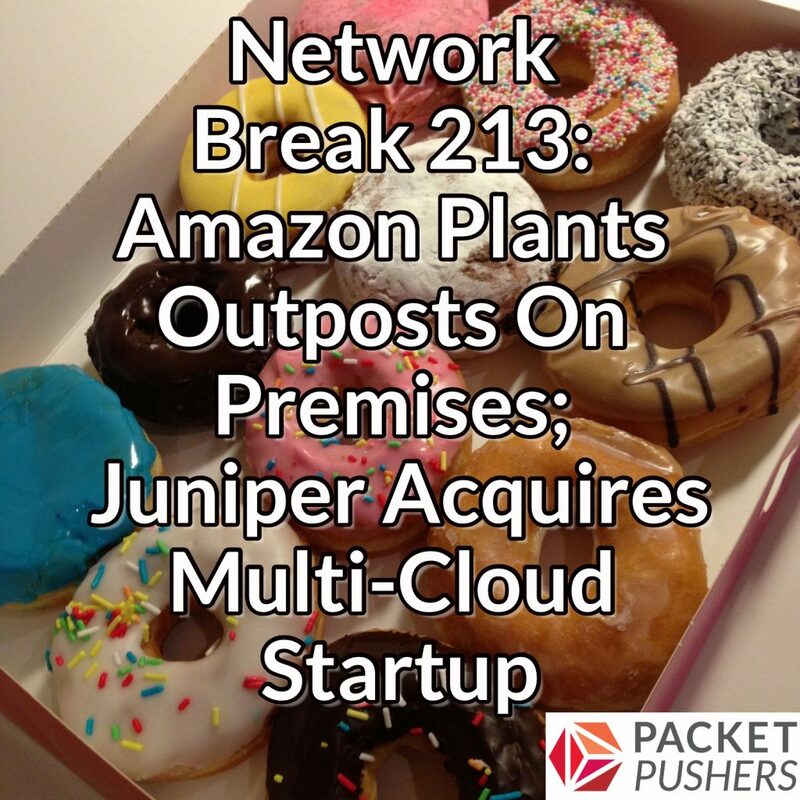 In non-Reinvent news, Juniper has announced its intent to acquire HTBASE, which makes multi-cloud control and data fabric software, VMware reported Q3 financial results, and 6Wind announced a new version of its software router. The CeBIT technology tradeshow is shutting its doors, the NVME storage interface now supports TCP for transport, and companies reported a rash of breach disclosures. Stay tuned after the news for a sponsored Tech Bytes conversation with VIAVI. We’ll talk about performance management and the essential role of user experience for turning piles of data into actionable insights for monitoring and troubleshooting. Visit viavisolutions.com/packetpushers to access a 14 day free trial of ObserverLIVE. Register now for the Packet Pushers’ Virtual Design Clinic on December 19th. This live, online event includes deep-dive technical presentations for network engineers and Ask Me Anything sessions with expert panelists. And it’s free! Register here.